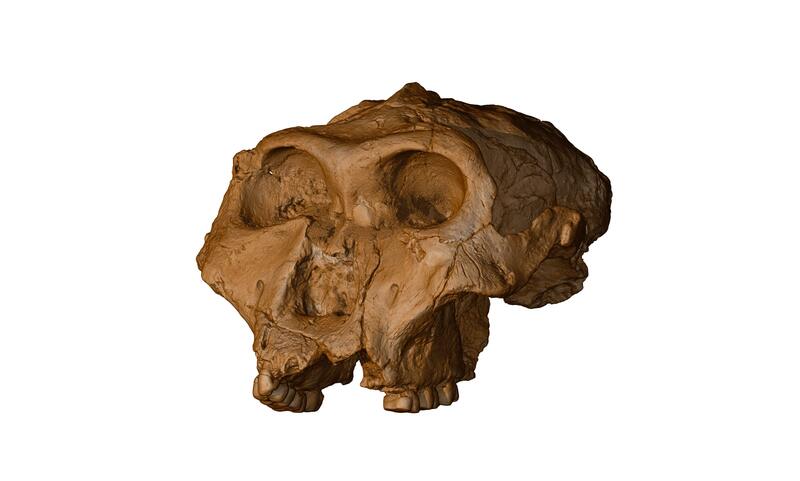 Major changes in the hydrological cycle have taken place in southeastern Africa over the last two million years, which may have influenced human evolution and in particular could have played a role in the extinction of the robust australopith Paranthropus robustus. Our paper (Caley et al., 2018 Nature) has a long time process that started in 2006, while I was preparing my master’s thesis, if not earlier (1996) when considering the year of recovery of the geological material from which our paleoenvironmental records have been derived. The objective of my master project was to unravel the past dynamics of precipitations in southeastern Africa at around 175 kyr before present (BP), a time period referred to the marine isotopic substage 6.5 (MIS 6.5). My then supervisor, Bruno Malaizé, who started his career as an ice core specialist / glaciologist, noticed an intriguing geochemical signal in the oxygen trapped in air bubbles in Antarctic ice as old as 175 kyr BP that could eventually be attributed to an anomaly of precipitation in the tropics during this time period. A marine sediment core (MD96-2048) collected in 1996 out of the Limpopo river, southeastern Africa, during the MOZAPHARE research cruise with the French RV Marion Dufresne was yet unstudied and was part of the collection of circum African geological records that were assembled for reconstructing past precipitation around Africa. 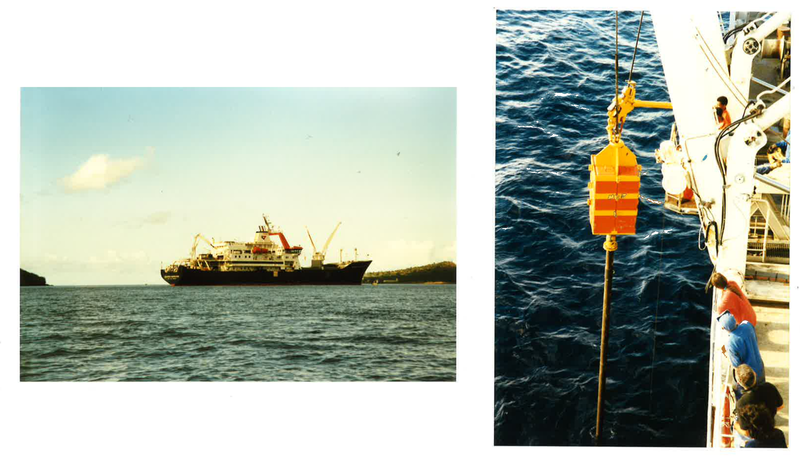 Photos of the RV Marion Dufresne (left) and CALYPSO piston-corer (right) during the MOZAPHARE cruise in 1996 (Credit: Marie-Hélène Castera). The data and proxies generated during my master’s thesis, and later during my PhD thesis that also partly focused on monsoon dynamics around the Indian Ocean, did not allow to reconstruct past precipitation changes over southeastern Africa with a high degree of confidence. After my PhD thesis and thanks to the emergence of new proxies (water isotopes measurements on specific compounds of organic matter such as leaf waxes) and a new equipment (XRF core scanner) acquired by the EPOC laboratory, University of Bordeaux, it became possible to reconstruct the dynamic of past precipitations with a higher degree of confidence. We started new measurements and international collaborations to reach this goal. In parallel we became interested in studies linking past climate changes and human evolution in Africa. The climatic and environmental context of southeastern Africa was poorly understood, while climatic or environmental changes, particularly those related to the hydrological cycle, were likely to have played an important role in the evolution of the continental ecosystems that fostered the evolution of ancient hominins. Our marine sediment record was ideally located to establish a link between climate changes and human evolution since the Limpopo catchment includes the region called the "Cradle of Humankind" that is extremely rich in hominin-bearing sites. However, we just had a rough idea of the oldest age of our record because during my PhD thesis I had only worked on the first 12 meters of the core that correspond to around 800 kyr. But the core was much longer….around 36 meters. 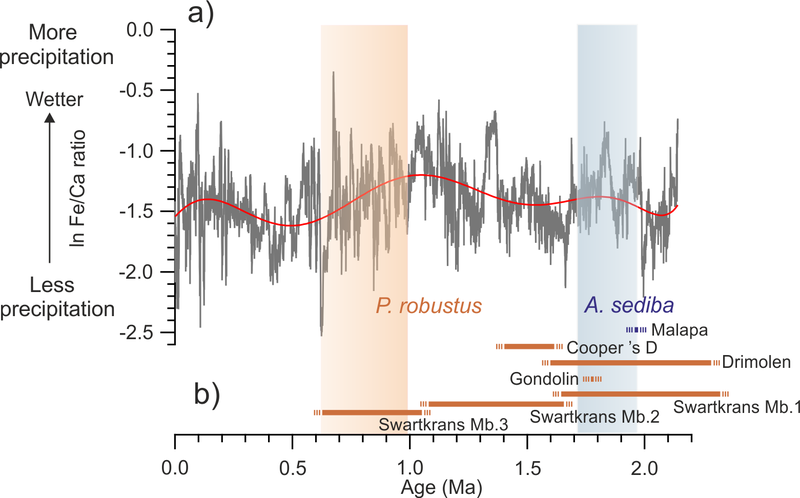 Our new age model over the entire length of the sediment core showed that this archive covers the last 2.14 Myr and so encompasses the time interval with known occurrences of Australopithecus sediba and Paranthropus robustus. Working on climate-early human connections in northern Africa as part of another project, we started a collaboration with Antoine Souron, a paleontologist specialized in the evolution of Plio-Pleistocene African mammals. We also looked for the expertise of other colleagues in order to finalize our multi-proxy approach and to validate the use of our proxies for a robust reconstruction of precipitation changes. The integration of all the results highlight that major changes (see Figure below) in the hydrological cycle have taken place in southeastern Africa over the last two million years, which may have influenced human evolution and in particular could have played a role in the extinction of the robust australopith Paranthropus robustus. a) ln (Fe/Ca) ratio in sediment core MD96-2048 as a proxy of precipitation changes in the Limpopo River catchment. The gray frame indicates a relatively wetter period and the red frame a relatively more arid period combined with extreme multi-millennial hydrological changes. b) Estimated age for main sites containing remains of the hominin Paranthropus robustus (Cooper’s D, Drimolen, Swartkrans, and Gondolin) and Australopithecus sediba (Malapa) (modified from Caley et al., 2018 Nature). This summary was written by Thibaut Caley, Bruno Malaizé, Antoine Souron and Jacques Giraudeau.